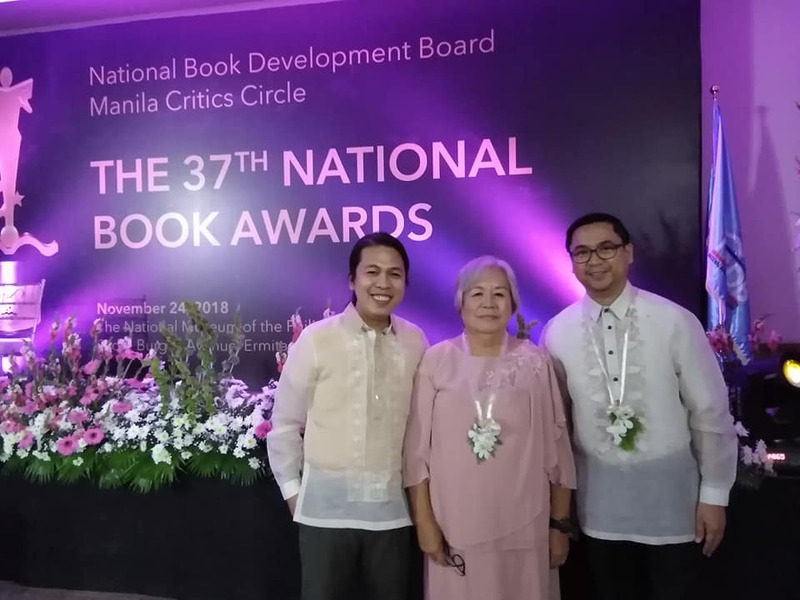 The National Book Development Board (NBDB) and the Manila Critics Circle have recognized the books of Emmanuel Velasco and Dr. Merlie Alunan as the country’s best book for Poetry in Filipino and English categories during the 37th National Book Award ceremony held last 24 November 2018 at the National Museum, Manila. Both books were published by the Ateneo de Naga University Press, considered to be one of the most innovative and productive university presses in the country today. Kristian Sendon Cordero, the press’ university deputy director, together with Ms. Cyril Camacho, the press’ marketing officer were also present during the awarding ceremony. NBA honors the country’s best writers, editors, graphic illustrators and publishers. Emmanuel Velasco’s second book of poetry Mga Sugat ng Naligaw sa Gubat is highly lyrical and deeply penetrating in terms of its voice, and poetic insight. Dr. Allan Popa who is part of the jury described the book of Velasco as ‘necessary and urgent” in this particularly troubled times. Dr. Merlie Alunan, a retired professor of the University of the Philippines-Tacloban and is one of the country’s revered poets and scholars won for his Running with Ghosts. Alunan’s poetry collection talks about how the poet sees herself as both a survivor and a storyteller after Typhoon Yolanda hit her area in 2013. Like Velasco’s collection, Alunan’s poetry invite readers to intimately listen to this kind of poetry that speaks to the immediate wounds. Other titles from ADNU Press that were shortlisted as finalists are Jerry Gracio’s Waray Hiunong Sa Gugma/Walang Tungkol Sa Pag-ibig for Best Book of Poetry in Filipino and G. B. Calleja’s Kun Sana Si Shakes Taga-Sato, the first complete translation of Shakespeare sonnets in Bikol.